You have officially finished your bug out bag and now you have to figure out if you are going to be close to your location at all times. Of course you aren’t. You are out there to explore. Perhaps you are hunting that buck you have been tracking for a while, you wound it and begin tracking its blood trail or maybe you are out mushroom hunting and you hear other humans and you haven’t the faintest idea if they are friendly or if they are armed. So you freak out and run in the opposite direction unfamiliar to you. What does this have to do with anything? You are out in the wilderness and you can lose your sense of direction and this is where a survival watch comes in handy. 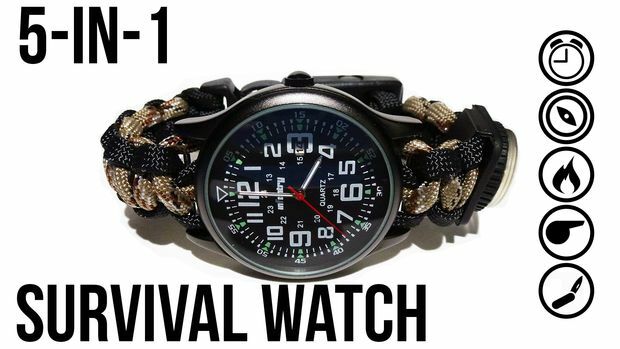 Most good survival watches are high quality and high tech these days. They can do more than just tell you the time. They can point you in the right direction of your camp, help you start fires, and so much more. Now, I do believe that you shouldn’t rely on technology completely, but in a certain situation, it could fail. That is why I choose watches that have certain features such as solar charging or winding that will help to keep the battery charged and able to use. I love the useful features such as thermometer, barometer, compass, and sometimes that nifty Firestarter. I also tend to go with the ones that have paracord bands.